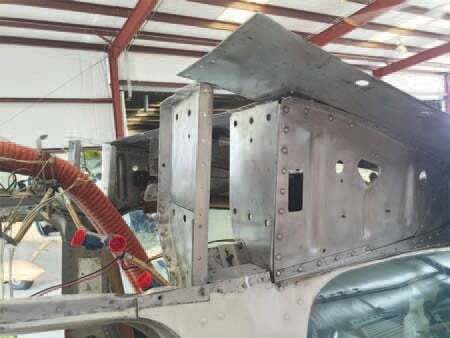 Transplant Surgery | Tennessee Aircraft Services, Inc.
It’s pretty obvious that one of the most intense parts of any airplane is the structure that holds the wings on the fuselage. For the cantilever winged Cardinal series the single piece that holds both wings in place is the carry-thru spar. As vital as this one component is, we often find its proper care neglected. At some point an airplane physician may discover the results of this neglect during the annual wellness check. The recommended cure may likely call for major transplant surgery. The first step in prevention is a realization that a problem exists. Step two is to know when/ where/what to look for. Third step is learning what can be done to ward off the attacking agent. In the case of the Cardinal, the problem is corrosion on the wing spar carry-thru. This massive forty pound chunk of aluminum was installed at the factory without benefit of any substantial corrosion protection. Its vulnerability is compounded by the environment in which it’s forced to live. The carry-thru sits in the very top of the cabin, which is similar to being hung in the attic of a green house, especially in the more humid climates. The heating and cooling cycles inside this greenhouse pulls moisture out of the air and can actually condense in the form of water droplets on the available aluminum structure. The large mass of the carry-thru make it a primary target for condensation, resulting in heightened corrosion susceptibility. Access to the carry-thru varies with the different headliners used over the years, but it is never too difficult. A complete and proper visual inspection does require more than just a passing view. The advent of inexpensive videoscopes helps in this process immensely. One common issue is how the headliner interacts across the bottom surface of the carry- thru. As old as these planes are, it’s very likely that some nonstandard foam padding or adhesive has been used at some point in the plane’s history. Adhesives can be hydroscopic, which greatly exaggerates corrosion growth. Any fabric material that makes contact with aluminum is an area to be watched. Many fire retardant chemicals applied to interior fabrics actually attack aluminum at a much faster rate than simple moisture. 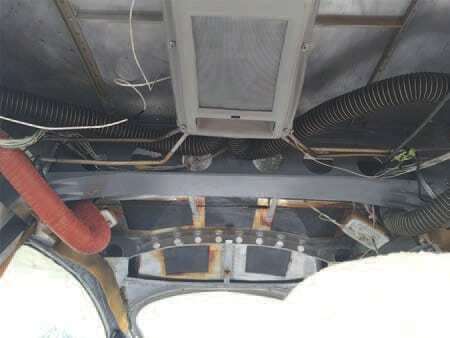 I’ve seen improperly treated headliner material initiate corrosion on cabin aluminum parts and grow at such a rate as to render primary structural components unusable in less than a year’s time. Other than ensuring all corrosion inducing materials are no longer in direct contact with aluminum parts, simple application of some corrosion inhibiting agent is all that’s needed. ACF-50 and Corrosion X are the two best known corrosion inhibitors and can easily be applied by anyone. Neither of these will fix existing damage, but they will stop any further corrosion growth. A sixteen ounce aerosol can of either will only cost about fifteen dollars. Spray it on or wipe it on with a rag to help keep it off of any upholstery. Depending on your location, this effort may need to be duplicated every year or two. The price delta between a few ounces of prevention and replacing a damaged carrythru is an order of magnitude increase in one’s aviation budget. At some point in the life of every plane comes a time when some catastrophic airframe structural fault render it unairworthy. It could be something obvious like total destruction due to a hangar collapse or a fight with an errant delivery truck. More insidious is the slow hidden cancerous growth of corrosion, but the damage is no less catastrophic. Unlike the hangar collapse, corrosion often isn’t discovered unless some knowledgeable person intentionally looks for it. Found early enough, the damaged structure may be saved with simple application of a corrosion inhibitor like ACF-50 or Corrosion. Ignored, and the damage may consume enough material to render the airframe completely unusable. Anything in-between is just a matter of finances. On our subject 177RG, corrosion on the wing spar carry-thru was found by the owners’ mechanic during routine scheduled inspection. The discovery set in motion an extreme exercise in detailing the extent of the damage. All corrosion was removed and damaged areas fared out. A grid was drawn on the part so each and every damaged spot could be located, measured, photographed and fully documented. All was sent to Cessna engineering for evaluation. The hope was none of the damage spots exceeded structural material loss. The depth and extent of each spot was compared to the original part design as well as the overall loss. Sometimes a final report includes hope for some repair that can be applied, thus saving the part. Unfortunately, cantilever wing spar carry- thru design and nature don’t lend themselves to repair schemes. The sad prognosis called for transplant. The damaged spar with the grid markings created by the owner’s mechanic that found the corrosion damage. 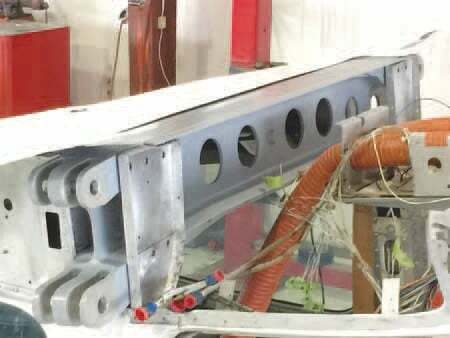 Pictures and details of the damage sent to Cessna engineering proved the carry-thru spar was not fit for airworthy service. If you find yourself in this position, expect to spend a fair amount of time searching the internet and calling the airplane boneyards. The installing mechanic is responsible for the airworthiness of any replacement part, so more inspections are in order when the replacement arrives. 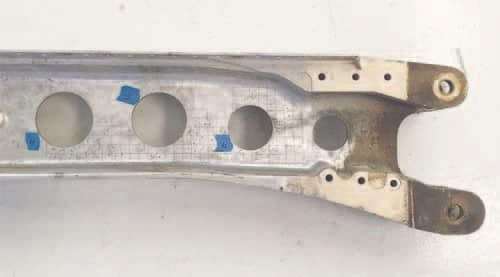 Part suppliers will usually take a carry-thru back if it’s found unusable, but they may charge for their efforts to extract the part from the donor plane. 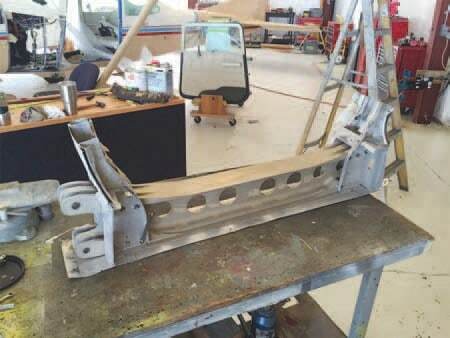 Cessna no longer builds new carry-thru spars, so the search for a viable donor was on. In our case, it took two tries to get a spar in good serviceable condition. The donor spar got a thorough scrubbing for a good visual inspection. All looked good so we prepped the unit with an etching compound and then a conversion coating to maximize primer adhesion and corrosion inhibiting. The steel bushing for the wing attachment pins were cleaned and lubricated. The mating surfaces of the carry-thru were covered during priming. Aircraft preparation started with wing removal. This was a fairly simple process and the service manual procedure was detailed enough. No special tools are involved for wing removal, and three or four people can easily lift the wing from the cabin. It is necessary to drain all the fuel from both wings before removing either one. The plane has no trouble staying upright with just one empty wing installed, but there’s likely to be severe listing if the one remaining attached wing is full of avgas. Carry-thru extraction included removing twelve large bolts and drilling rivets to be able to partially peel back the aft cabin top skin. A little slide this way, then lifting one side that way, a push and a shove, and the carry- thru was out. Unfortunately, with the carry-thru removed, only the cabin floor held the front of the plane to the back. We added support and bracing mechanisms to hold everything in place while the spar was in transit. Installation was pretty straight forward. The twelve mounting bolt holes were precision drilled at the factory, so their alignment wasn’t a problem. The only unknown was whether the rivet pattern on the top forward and aft spar flanges would line up with the original hole patterns in the cabin top skins. One would think all the rivet hole patterns would be very specific for direct interchangeability of parts. In the case of the spar carry-thru flange rivets, as with many areas of the plane, the factory installation plans were fairly vague. Instead of an exact hole pattern, the instructions to the person drilling the holes on the aircraft in situation were to measure out so many holes for a given distance. How those were spaced was up to the person holding the tape measure. For this Cardinal carry-thru installation and the times we’ve done the same job on the 210 series, these holes have matched up pretty well, usually about 97%. My assumption is that if the donor part is from a fairly close serial number, it’s likely the same person drilled the holes and used the same tape measure. The acceptable replacement carry-thru unit removed from the donor by cutting around supporting structure. It’s shown sitting upside down on the table. Replacement all cleaned up and laying in place. It’s just a few bolts and rivets away from completion. Carry-thru installed and ready for details of cabin reassembly. As structural repairs go, this one wasn’t so terrible. After all the overhead interior was removed, it only took about forty man hours to remove and install the wings. The actual spar replacement took another eighty man hours. This included removal and replacement of all electrical wiring, fuel lines, and flight control cables. Of course, everything had to be rigged, checked for leaks, and ops checked afterward. The real unknown in this type of repair event is the spar carry- thru itself. Someone has to spend an uncertain amount of time contacting an unknown number of possible sources just trying to find a serviceable part. Then, of course, there’s the price for the part. Since there’s no known pricing from Cessna, the asking prices for this spar could vary widely. Just a thumb nail check indicates one could pay anywhere from $2,000.00 to $10,000.00 for a good unit. I feel like a broken record when I say it, but an ounce of prevention is worth about 120 man hours of labor and $2K+ in parts. The best time to find this sort of damage is during the pre-purchase evaluation at the time you’re buying the plane. If you already own one of these, be sure all the hot spots for corrosion are thoroughly inspected, then invest in a few cans of corrosion inhibitor and get busy. You’ll be glad you did.